The Pentagon plans to sell $10.8 billion worth of advanced weaponry to Saudi Arabia and the United Arab Emirates. The hardware includes bunker buster bombs and cruise missiles. The planned deal includes shipping 1,000 GBU-39/B bombs to Saudi Arabia and 5,000 to the UAE, AFP reports. They have air-deployed wings, which allow them to strike targets as far away as 110km. Their warheads can penetrate up to a meter of reinforced concrete. The planned sale also includes sophisticated Standoff Land Attack Extended Range (SLAM-ER) and Joint Standoff Weapons (JSOW) cruise missiles. Both are meant for destroying surface targets from a long distance, allowing warplanes to stay out of the range of enemy air defenses. The Saudis will purchase 650 of the Boeing-manufactured SLAM-ERs and 973 Raytheon-made JSOWs, as well as other missiles. They are to pay $6.8 billion for the hardware, parts, training and logistical support. The United Arab Emirates is due to buy $4 billion worth of weaponry, including the bunker buster bombs, 300 SLAM-ERs and 1,200 JSOW missiles. The planned deal will be the first time the US delivers the sophisticated gliding bombs and missiles to the region. Back in April, Defense Secretary Chuck Hagel announced plans to sell $10 billion worth of arms to Israel, Saudi Arabia and the UAE. 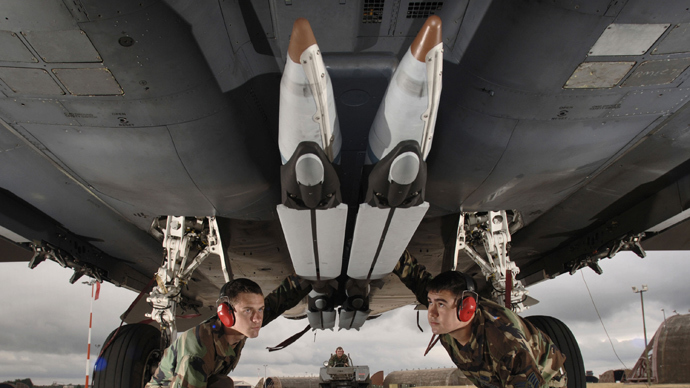 This week’s announcement details the munitions that the Gulf monarchies are seeking. DoD officials informed the Congress of the planned deal last week. Legislators have 30 days to block the sale, but this is unlikely to happen considering the US’ previous weapon deals with its Gulf allies. In 2011, the US signed a $29.4 billion deal with Saudi Arabia to sell 84 Boeing-made F-15 jets and upgrade 70 planes already owned by the kingdom. The Obama administration has also sold the UAE an anti-missile system called the Terminal High-Altitude Area Defense. The deal comes amid a period of rapprochement between the US and its long-time Middle Eastern foe Iran. Tehran and Washington have made a number of moves which may indicate a swift resolution to the conflict over Iran’s nuclear program and the lifting of economic sanctions the US imposed over it. The development has unnerved America’s autocratic allies in the region, which see Iran as their main regional rival. The weapons deal may be seen as Washington’s gesture to boost confidence in Riyadh and other Gulf capitals.